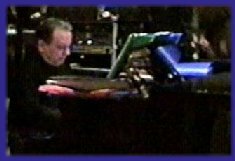 Paul plays "standards" by composers such as Gershwin, Jerome Kern, Cole Porter, Duke Ellington, and many modern "standards" also. It is a varied repotoire including many latin tunes as well. The style is what Paul calls "Lite Jazz", but listening tells the story. Listen to some of the music selections below. The tunes in this section are either solo or played on a keyboard with digital accompaniment. If you do not have an acoustic piano available for your party or event, we can supply a keyboard for your enjoyment. If you would rather have a small combo or vocalist, this is also available. Paul is available for out of town engagements.